it's around 8 saturday morning and the view from the window looks like it might be a beautiful day. however, I'm learning not to trust the view from the window or even an excursions out to predict what it's going to do for the day. for example yesterday morning the walk to the school bus stop with my niece was lovely, it felt warm and the sky was blue - I though 'great we are going to have nice weather.' yep, you see where this story is going! we left the house little bit later to accompany my nephew across town to his school (by the way I did put his winter coat on him) and begin our day's adventures. 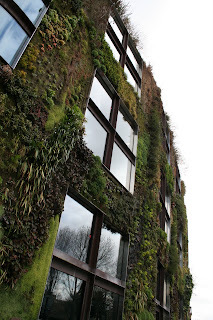 our destination yesterday was the musee du quai branly - conveniently located just a few blocks away! the museum opened at 10 which gave us plenty of time to find a patisserie and get a cafe au lait and a croissant. 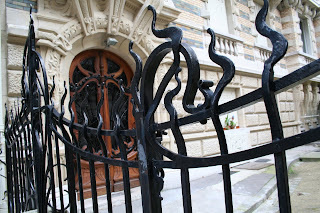 first stop was at the post office to drop off em's post cards and fortunately the post office was near some art nouveau buildings I discovered on wednesday at rapp square - emma wasn't with me so this was perfect. somehow in the five minutes it took us to drop adam off the weather changed - it got cold and the sky wasn't looking promising any longer. so, we didn't learn our lesson from the day before and wear winter coats. no problem at least it was dry. 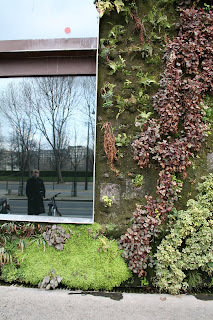 early afternoon when it came time for us to leave the musee du quai branly this was no longer the case. c'est dommage. the changeable weather and the experience at the patisserie didn't turn to be portents of the day nor did they dampen our day except in the literal sense. what about the patisserie, you might ask? here I thought you really couldn't get a bad cup of coffee or a bad pastry in paris - well, wrong!!! the cafe au lait was dreadful - it was so weak calling it coffee flavored water would be kind. and the croissant - edible, but not like the delicious croissants found at the place down the street from the apartment or the other croissants I've tasted around and about. in fact, this croissant was not even as good as the one we get at our local heinen's supermarket back in cleveland! oh well, not the end of the world - so I didn't get my morning coffee fix - today we'll make up for it and head down and get a wonderful cafe au lait at the neighborhood joint. 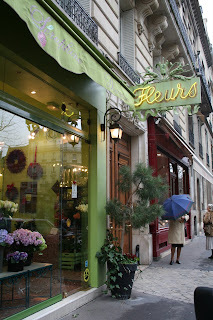 if you find yourself in paris and jonesing for a good cup of coffee let me tell you avoid "au levain" on av rapp! -- walk a bit in any direction and you'll stumble on another patisserie - boulangerie, undoubtedly they will provide the sustenance and caffeine you seek! on to bigger and better things! 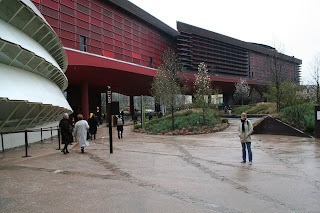 our expeience at the musee du quai branly was amazing as the museum itself is amazing. on one hand it reminded me of one of my favorite museums of all time - 'the musee de la civilisation' in quebec. but it was like that museum on steriods - the quai was incredible - the collection immense and the building HUGE. for folk interested in anthropology and different cultures this is a place to get lost in. and the building - or should I say buildings - are marvels to behold. 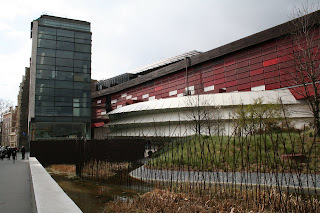 the museum complex consists of four buildings and each is an architectural jewel in it's own right - from the red louvered building of the main exhibition hall to the green wall (and I mean GREEN, as is living, growing green wall) of the building which faces the quai branly. unlike most museums I've been to in europe, the quai does not allow photography of the inside collection. of course this rule is easy to understand considering the fragile condition and age of many of the artifacts on display. the museum lighting is also very low to help in the preservation efforts, so no-flash photography would present a problem - no sense tempting folks! just a bit more on the museum interior, I found it deligtfully organic - there are no formal, rectilinear galleries; collections from the representative cultures are gently united as you wander through the curving spaces of the interior exhibition hall. after visiting the museum we popped into the gift shop. my only disappointment is that I don't have a better facility with french - while I can read it passably well, there is no way I could make my way though the very interesting, yet scholarly texts that piqued my interest. however, I did quite well understanding all the words in the children's books I leafed through. however, my pronouncation of french is so horrid, there is no way I would subject a child to my reading aloud the story of "martin le rat et marion la souris" - instead of buying books emma and I left with a list of books in order to see if we can find them in english at the libraries or on one of the internet bookstores. keeping with our theme of cultural diversity we decided to have indian food for lunch. actually the decision was more prompted by having a difficult time resisting the curry aromas and it was RIGHT there and the weather was getting really wet. what a good food decision that was, the restaurant we went to is named "le new jawad" although we only sampled two dishes, the 'butter chicken' we had was simply out of this world - the best I've ever tasted and the version of this favorite dish is one I will be dreaming of for years. if only I could get the recipe - I know there has to be some secret - or maybe it's the quality of the french butter used. it was interesting to eat indian food in paris and watch the other diners - emma and I approach eating indian food I expect the way it's meant to be - with nan in hand we like to scoop and soak up our saucy fare. it was amusing to see some people using a knife and a fork to cut their nan and daintily eat the bits. yes, I admit the interior of the restaurant was really fancy; many indian restaurants are very elaborately and fancily decorated, so really now! it was about 2:30 by the time we finished lunch just enough time for a brief stroll and bit of window shopping - and window shopping is about all we can afford to do here - the chocolate at one chocolate shop was 66 euros a kilo. I know when I will be buying a bit of chocolate it will be pricey, but I don't think the chocolate at the two shops I like to frequent is quite that dear. but it's fun to look at all the beautiful window displays and signs and imagine. fortunately by mid-afternoon the weather was just somewhat misty and only small periods of light showers and it really didn't feel that cold any more! we picked up a very happy nephew and it was home again, home again jiggity jig. we had another relaxed evening with the kids.... making supper, reading stories, being domestic and since it was friday night no homework to go over (however, I must say going over and discussing my niece's math homework with her the night before was fun - and I hope my 'math can be fun' mantra will make an impact - of course, the problems were fraction problems and those are the kind of math problems I enjoy most I don't know if I would have been a math booster had the problem been something out of my realm of understanding.) after the kids were clean and tucked in emma ate our 'vehicles for butter' - artichokes, we enjoyed a nice bottle of french wine and then played cards until eyes were crossing and it was time to crash.